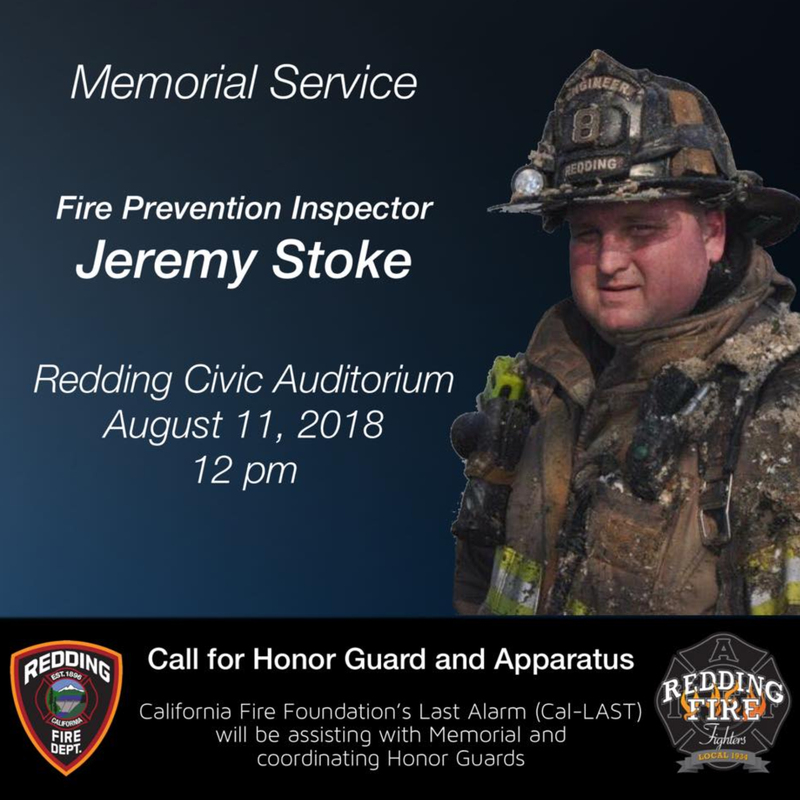 The Carr fire of 2018 wounded Redding badly. A few local citizens hired a local film studio named speropictures to create something about special about it, and it is quite amazing. The live event premiere of the short seems to have been taken down. But here is a trailer for what may be a monger version. 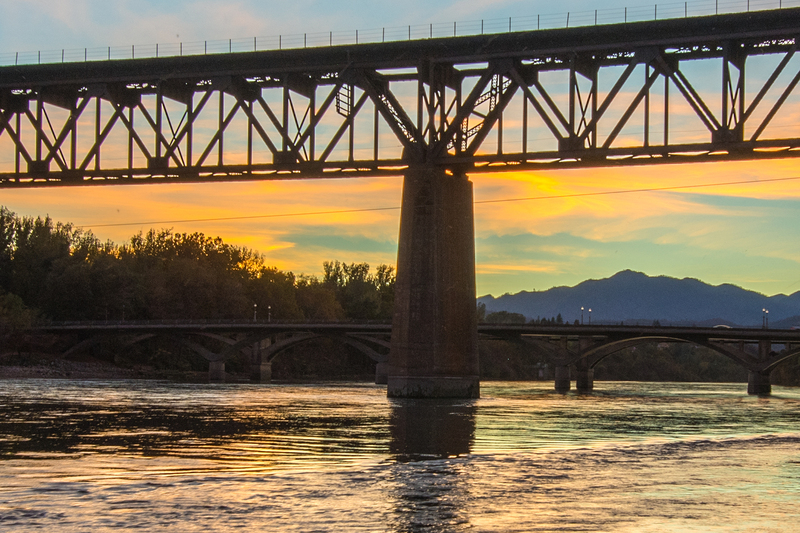 It reveals a lot about Redding. We all learned more about ourselves and our community during and after the fire. For me personally, watching the short film brought back some of the PTSD like feelings surrounding the evacuation. My home did not burn, but the beast burned homes on the next ridge over from us. I’ve no idea why it stopped there. I saw and heard the fire tornado firsthand. Nothing could stop it. I was pleased to see my name in the credits, although I had nearly nothing to do with the production. They used a brief video clip from the video of the fire tornado I shot before fleeing for my life. 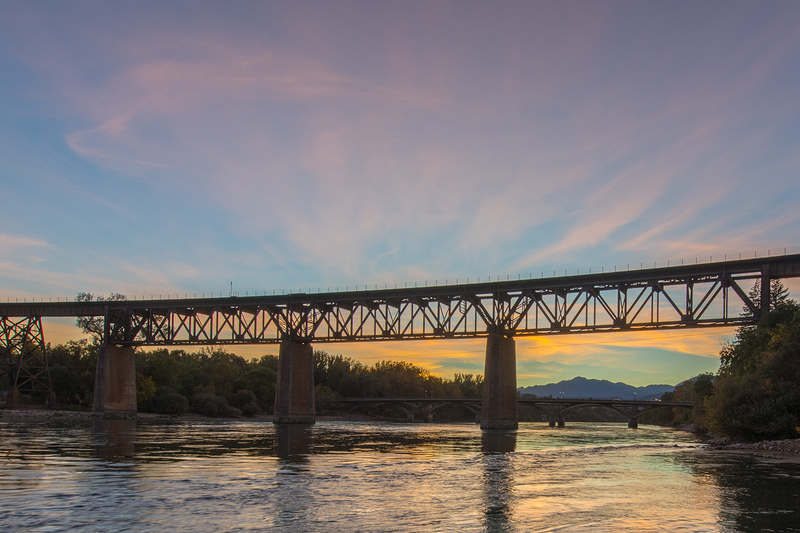 Unseasonably warm November weather helped me decide to shoot a timelapse of the Sacramento River at the rail trestle. It wasn’t a super spectacular sunset, but it was very pretty nonetheless. Over the course of shooting, I was surprised to see a great many fish leaping out of the water. I guess I never watched the river at sunset for a 20 minute stretch before. It was really pleasant. 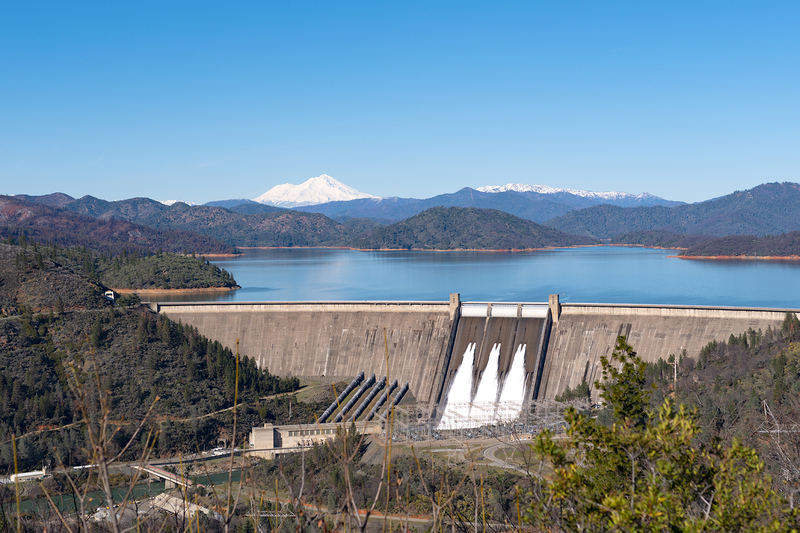 Timelapse of the sky and lake taken 1/26/2018 from the Shasta Dam overlook. It was a beautiful day. Watch full screen. 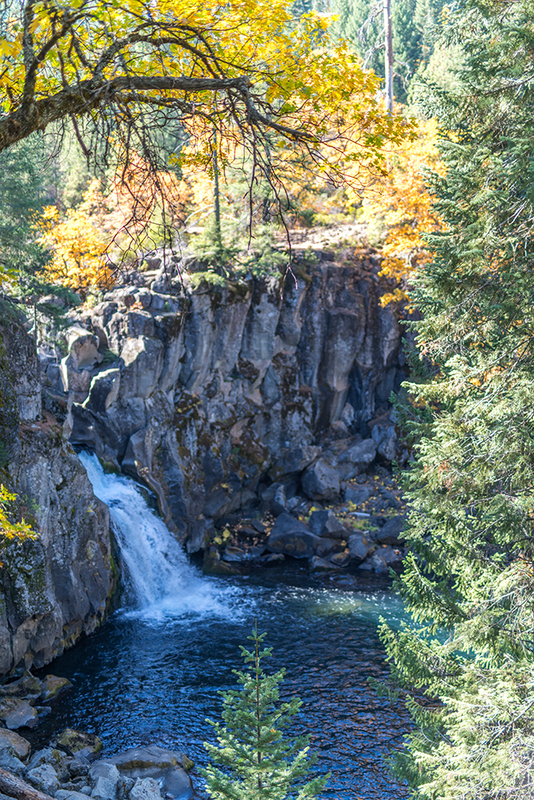 With perfect Fall weather, we and the dog spent the day hiking around the 3 waterfalls of the McCloud River you can reach easily from Highway 89. 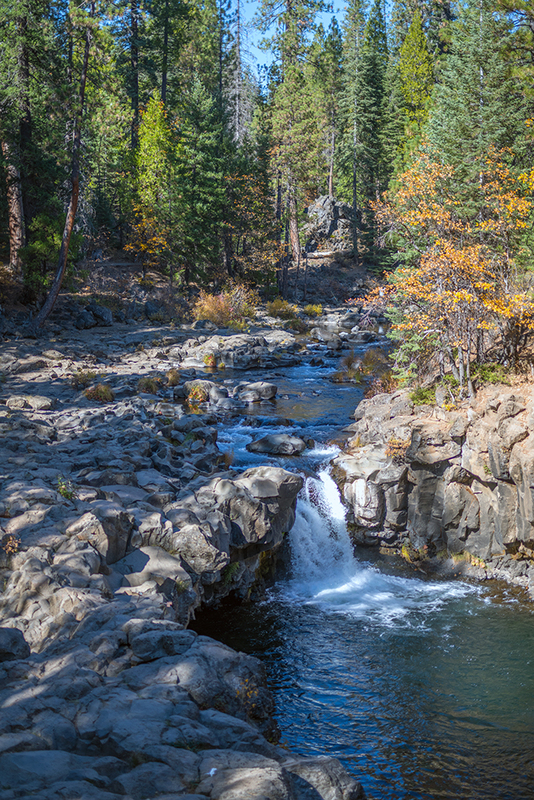 Just over an hour’s drive north from Redding, this beautiful stretch of river is an easy and dog friendly day hike. Not even a fee to park. 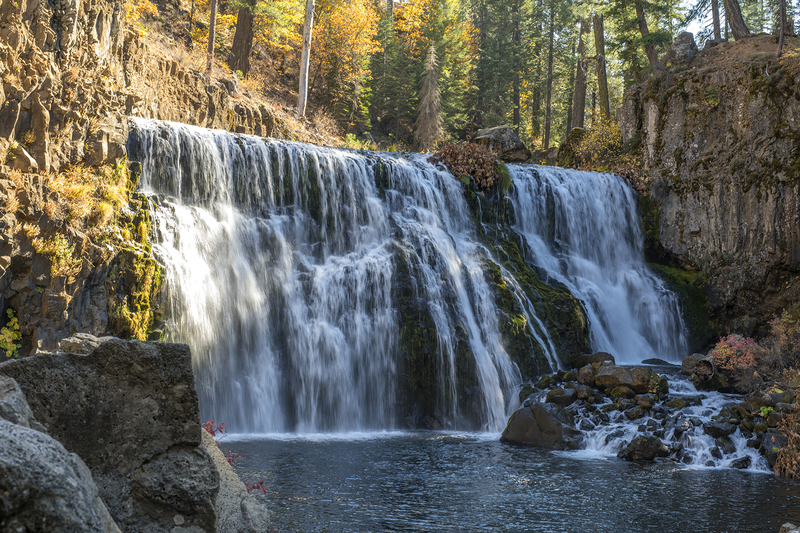 The McCloud River begins on the slopes of Mt Shasta, and terminates at Lake Shasta. It’s a true place of wonder. 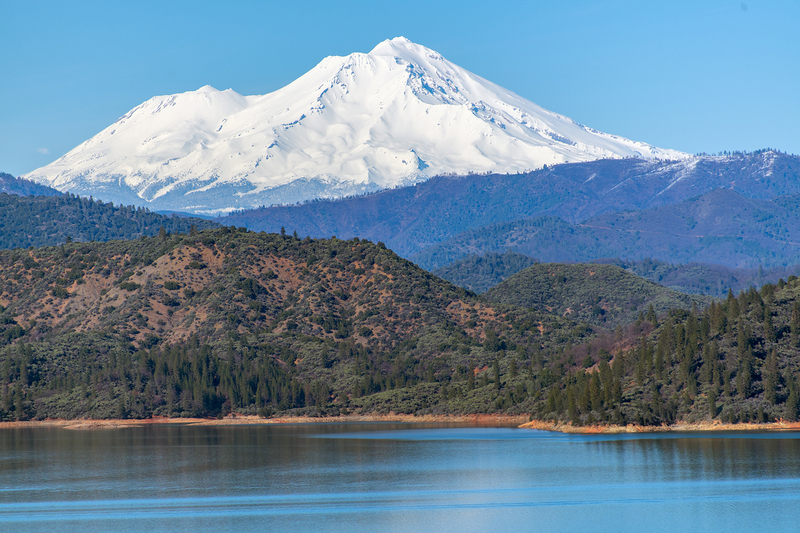 Is it Shasta Lake, or Lake Shasta? 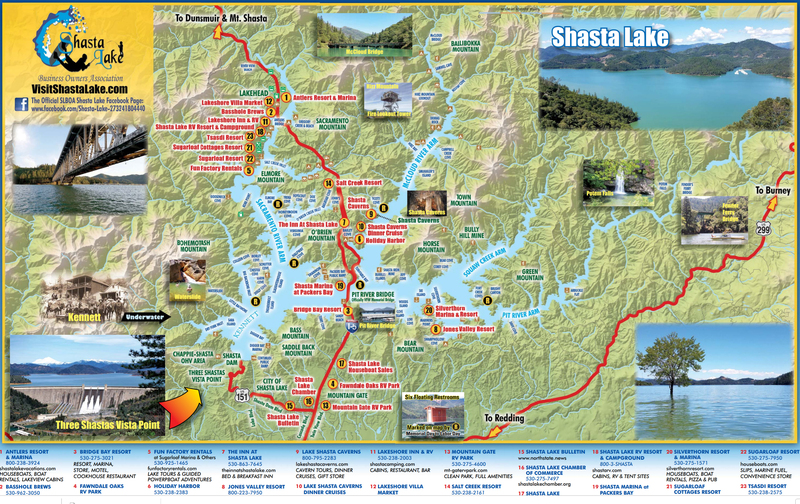 Anyway, here’s a nice looking commercial map of Lake Shasta. Click to enlarge. Northstate news also publishes several local newspapers and magazines to which you may subscribe, including Shasta Lake Bulletin, Intermountain News, and After 5. Expand to Full Screen for 4K resolution. Timelapse 4K 1 frame per second, 9/5/2018. The very aggressive Delta Fire, burning just north of Lakehead. Fire season this year is like nothing anyone has ever seen. Anyone aware acknowledges that years of fire suppression and lack of adequate fuel reduction has created ticking time bombs in our local forests. This year, several exploded. Underneath is all is the anthropomorphic climate warming factor. Several “warmest years ever” contributed to this terrible season. I don’t know how much of a factor climate was, and neither do you. But now anyone can visualize a worst case scenario where runaway thermal changes create constant explosive wildfire dangers. The effects of climate warming were predicted to take place across many years. I didn’t expect to see those effects so vividly on display in my lifetime. Is this our new normal? Turned out to be something of an understatement. I shot this video from the Rocky Point Charter School soccer field on July 26th at 7:27 pm. My city in flames. I haven’t posted here in a while. It’s just so sad. The Carr Fire beast is now extinguished, after just over a month. But not before taking a horrific 230,000 acre bite out the northstate. I recall driving around west Redding and often thinking to myself, this place is a powder keg. Like the same way you know the Bay Area will be hit by a giant earthquake at some point, but life goes on as though it might never happen. At least, not today. It’s one thing to expect a natural disaster, and yet another entirely differently thing to witness and survive. Forest fires are routine here. Just the day before the video above, I shot this view of the Carr Fire smoke from the same place at the school. I never imagined it would reach Redding. The next day, it jumped over the Sacramento River like it wasn’t even there. It burned Shasta, Keswick, and parts of Redding, and killed 5 people that day. We are fine. My home survived. Many did not. We evacuated to a friend’s house in Cottonwood. Much of NW Redding evacuated to friends and family. It was extraordinary. What do you take? What do you leave behind? Where will you go? We all learned a lot that day. About the video: The next morning after the fire tornado, I watched the video. I quickly realized it was something that should be seen as widely as possible. It went semi-viral on Facebook. My friend Craig Padilla posted a compressed version on Twitter, and that went viral too. That same morning, I received phone calls from 2 companies bidding against one another wanting to license the video to generate revenue. I’d never even heard of that concept. Still in shock from the whole ordeal, I gave the rights to this video to Viral Hog, a company I’d never heard of, in hopes that any revenue generated could be donated to fire victims. So far the video has generated $360. There were some unintended consequences. I had tried to send it to KRCR TV and Redding.com before licensing, but evidently was unsuccessful from my refugee computer. 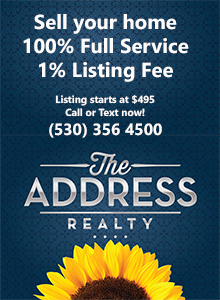 Later, I got a call from Jenny Espino of Redding.com, and I could hear the disappointment when I told her I’d sold the rights. So ironically, it has not appeared on any local news outlets, as far as I can tell. I think that’s too bad. So in some ways, I wish I had not sold the rights. I didn’t consider all the consequences. It all happened very quickly. I did get the video to Cal Fire, at their request. And to an atmospheric scientist at UNLV, who also requested it. Yesterday, I got a call from a representative of The Ellen Show, so maybe it will be there too. I referred them to Viral Hog. When I see the video now, I see the homes lost, the lives lost. Anyway, I’m torn about posting. I haven’t posted here in a couple months. Redding has been wounded, and it still hurts. I know we’ll bounce back. I’ve seen it happen in communities like Weed, that rebuilt after the Boles Fire. 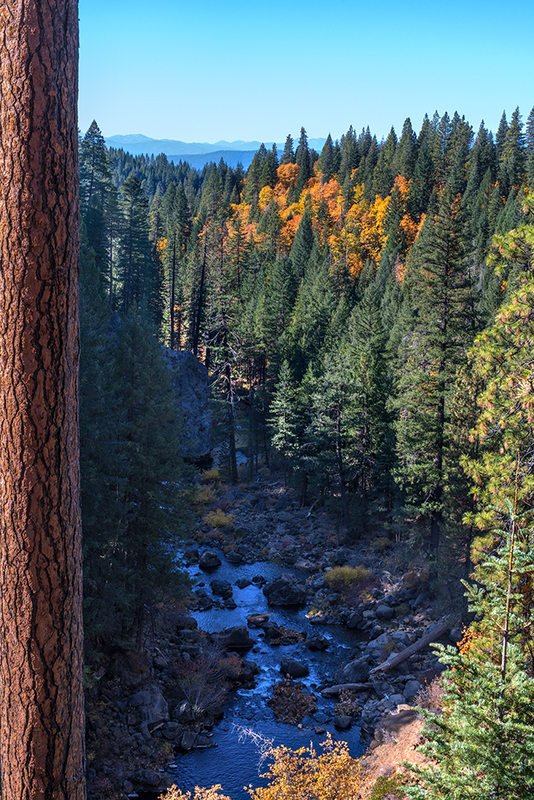 I even wrote about Redding’s fire-based economy in 2009. Ironically, back then I thought the Stillwater Business Park was Redding’s future, while the fire economy was a “dead end.” Looks like I had that completely backwards. We celebrate Independence Day in Redding with a big free fireworks show put on every year by the generous McConnell foundation. Here it is as I captured 4K video from a friend’s kitchen in the west hills. 20 minutes condensed to 30 seconds, or so. If you use the YouTube controls, you can see this in full 4K video. I like how it turned out. Personal fireworks are forbidden in Shasta County, for good reason. This place is very flammable in Summer. But this big free show really makes up for that restriction. Free fireworks shows, that’s Really Redding.